Yes it does Bill and I will say that is not me. Thanks for the insight and clarificaion. I will have to look up a close-up pic of that area of the camera for better understanding. Important issue better clarified now. Everything leading up to and the actual P-G film appear spontaneous. Daniel Perez, you know what the experience is to be in the Bluff Creek area and look through the viewfinder. I put a nickel next to the shutter release for scale. This is the off position. The lever is in the locked down, continuous shooting mode. This is the human side of the viewfinder. There is a 25mm viewfinder lens at the Patty end. My camera optics don't pick up the aiming targets and framing silhouette. Ask and you shall receive. This helps in my understanding and I am sure many others. Great pics. That makes a lot more sense. This is something that has somewhat confused me about the film speed and Patty's walk. These are John Napier's comments, from Wiki: John Napier, a primatologist, claimed that "if the movie was filmed at 24 frame/s then the creature's walk cannot be distinguished from a normal human walk. If it was filmed at 16 or 18 frame/s, there are a number of important respects in which it is quite unlike man's gait. It's been established Patty walks with a nonhuman bent knee gait and in addition, some have noted she also rotates her knees laterally as she walks. When you consider John Napier's comment about 24 fps, wouldn't this be another indication that 24 fps could be pretty much eliminated as the actual film speed? Looks like he died in 1987 so he did not have access to high quality film like we do in the Youtube world and digital video world. I always wonder how those big dogs of the day would feel if they could view what we have today. He was likely limited to VHS tape viewing. As far as this Quote posted by Dr. Napier, I find it interesting he doesn't say, "Well, it's an obvious hoax" That should be telling to all those who say it is an obvious hoax. Napier seems to mean he is aware of the bent knee, but seems to expect if the walking figure gets past a certain filming speed, a person in a suit could no longer maintain the bent knee walk. I think of a quote by Stan the man Winston who states Patty is a guy in a bad fur suit. Stan 'sees' this as a suit guy on what seemed to be a passing glance at the film and a confidence he expects he could make anything. Yet, look as the biomechanical understanding of John Napier, Grieve, and others who gave opinions on the film. The film has been shown conclusively to have been shot at the lower range, Okie....at 16-18 fps. 24fps has been definitively ruled-out...on at least a few points. What makes it highly unlikely to be a human, at the slower filming speeds...has more to do with the swing of the arms...(I think)….rather than the bent-kneed gait. I'll try to find Grover Krantz' analysis, regarding that detail. It has something to do with a slower 'arm swing' being more consistent with the arms being very heavy. Sweaty, I agree with your first comment; any film speed estimate/study so far all point to 16-18 fps as the correct film speed. 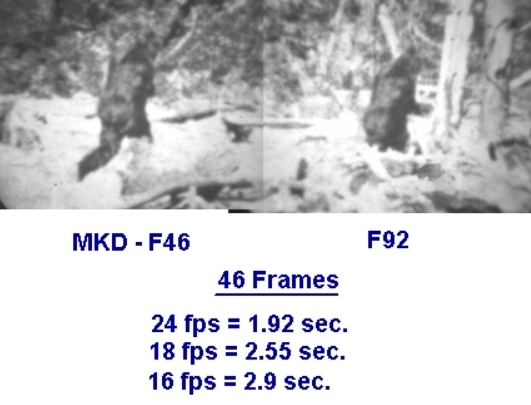 I know this is an obvious statement but if 24 fps was the correct film speed, you would think conclusions of studies that are trying to determine the correct film speed would point to 24 fps. Yet that isn't what's happened; studies point to 16-18 fps. Your comments about the arm swing were interesting. That's an aspect that gets noticed but it usually isn't part of an analysis. Grover Krantz's comments should be interesting. Also....in addition to all the analyses pointing to the slower filming speeds...Roger said that the speed dial was set to "18", when he checked it some time after shooting the film. But, since there is no number '18' on the dial, the logical conclusion to make is that Roger simply mis-read the number '16'...as '18'. Just under 2 seconds for the entire 'look back' segment, if the film was shot at 24fps. Took one step with her right leg...(looking at Roger)…. Took one step with her left leg....(still looking at Roger)…. …...in 1.9 seconds??? I doubt it. Note: The frame numbers shown are the numbers in MK Davis' stabilized animation....not actual PGF film frame numbers. I'll try to post his analysis on that detail, sometime tomorrow . It is hard to imagine the whole look back sequence happening in a little under 2 seconds. I think something that's important to keep in mind is how Patty turns during this sequence. She doesn't simply turn her head and neck while keeping her whole body facing forward, like a human would. She turns her shoulders and upper body to look back at Roger. This would require a bit more physical effort. When played back at 24 fps, I wonder if the whole look back sequence would appear to happen too fast and look unnatural; similar to how Rene Dahinden described the horses movements as 'jerky and unnatural' when viewed at 24 fps. It is hard to imagine the whole look back sequence happening in a little under 2 seconds. It sure is hard to imagine, Okie....for good reason. 2 seconds, or less....just isn't enough time for that walk segment. I think something that's important to keep in mind is how Patty turns during this sequence. She doesn't simply turn her head and neck while keeping her whole body facing forward, like a human would. She turns her shoulders and upper body to look back at Roger. This would require a bit more physical effort. One thing to consider, also....is that Patty was looking at Roger for maybe only about half of the time in that sequence of film frames.....which would be for only 1 second...(at the filming speed of 24fps). And, under the 'real' scenario....would a Sasquatch turn it's entire body to look back at a potential threat to it's well being...for only one second?? Probably not. It probably would want to take a slightly longer look. It probably would look too fast, and "jerky". One other thing that indicates Patty's walk was not very fast....is Bob Gimlin's description of the pace of her walk. I don't remember his exact wording, but he said that she walked away at a 'normal' walking speed....not all that fast. Shirley you are kidding. You have to separate formats, film and digital. This thread, PGF, is about a 16mm film format. Throw away the digital 15, 30, 60 and 120. Reviewing, the K-100, built in the 50's, has 16, 24, 32, 48 and 64 frames per second. Designed to film football games and view the images on variable speed projectors of the era. Normal speed was 16fps. Sound speed was 24fps. Higher speeds were for slow motion. Current debate is on 16fps being 18fps on the K-100. We do not know if all K-100's were tweaked by Kodak to have 18fps at the lowest setting. The operational characteristics of the PGF camera are unknown and will probably never be known. We will have an average fps on about 10 cameras some day. Here is film for thought. If you are in a remote area with a fixed supply of film, what camera speed are you going to use? "Film run time" will eat up your stocks. At 24fps, 100 feet of 16mm film will last for 2 min. 46 seconds. At 18fps, you will get 3 minutes 42 seconds. At 16fps you will get 4 minutes 10 seconds. Those film speeds were for 'back in the day' and are the total film length exclusive of the leader and trailer parts exposed to day light during loading and unloading. Today, you will shoot film at 24fps to set up for digital scanning procedures. No whining about film versus digital. Some of the current epic movies are shot on film. Whatever the pre sets on camera settings what does that mean? i am assuming the preset can change by the control knob on speed. Otherwise it would stay at the pre set speed even if the operator turned the knob. Do I have that right? No. I am not sure what you mean by 'pre sets. For the K-100, the speed dial does not have any detents/stops. It is possible to bump the speed dial and change the film speed. Think variable. One could set the speed dial to the lowest setting and turn the dial while filming. Not recommended since the lens opening would have to be opened up simultaneously for more light. The shutter in the K-100 is a typical 'cinema shutter'. It is round and rotates and has an open segment that is 165 degrees. The setting of 16fps has an exposure time of 1/35 second. 24fps is 1/50 second. Faster film speed means more light required. I think that if Roger had bumped the speed dial, the film would be instantly less bright. No one has mentioned an exposure change. I do not know if the Ektachrome copies had adjustments for exposure. I think they lightened up the copies due to the black hair of Patty and they tried to get more detail.